He only has a few movies under his belt, but filmmaker David Gordon Green has already carved out enough of a niche that it�s easy to tell when he has at least some level of influence on a film. Making his mark with 2004�s Undertow, and really coming into his own with this year�s Snow Angels and Pineapple Express, he lent his talents as a producer to 2007�s little-seen indie film Shotgun Stories. Now, riding a wave of positive reviews, including a major push from renowned film critic, Roger Ebert, Shotgun Stories bows on DVD, courtesy of Genius Entertainment. The Hayes brothers live in a small town in the middle of nowhere, Arkansas. Son (Michael Shannon) is the oldest of the clan, and is dealing with trying to hold down a steady job while dealing with a gambling addiction that is driving away his wife, Annie (Glenda Pannell), and their son, Carter (Cole Hendrixson). Kid (Barlow Jacobs) relies on Son for shelter and isn�t sure how he�s going to have a life with his girlfriend, while Boy (Douglas Ligon) makes do living out of his van. When they learn of their estranged father�s death, Son leads his brothers to his funeral. Once there, Son interrupts the service to tell his father�s �new family� how the man abandoned his �old family.� This naturally upsets �new� sons Cleaman (Michael Abbott Jr.), Mark (Travis Smith), John (David Rhodes), and Stephen (Lynnsee Provence), and the epitome of a blood feud begins. While this does, indeed, have the feel of a David Gordon Green film, first-time writer/director Jeff Nichols does a fantastic job crafting a story that simply sneaks up on us and packs a punch that lingers long after the end credits roll. It�s strongest asset is the dialogue, which is a feast of natural speech between the characters that never comes across as forced. Nichols also does a fine job balancing the story�s light and dark moments, and ensures that the movie doesn�t remain bleak throughout, despite the deteriorating mood caused by the chain of events. This is a heck of a first effort for Nichols, and here�s hoping he collaborates with David Gordon Green in the near future. Rising star Michael Shannon first caught my eye in the obscure horror flick, Dead Birds, but it was his virtuoso performance in last year�s Bug that made me think he was really something special. His work in Shotgun Stories is much more subdued and nuanced, he�s equally as chilling. Jacobs does a solid job as the underachieving Kid, but Ligon�s work as Boy comes a close second to Shannon�s performance in terms of commanding the audience�s attention. When we first see Boy, he�s a hapless introvert, with his only escape being as coach of a local basketball team, but his work during the pivotal final moments is award-worthy. For the most part, the spotlight stays on Son, Kid, and Boy, but the actors behind the half-brothers that these three find themselves warring with hold their own as well. You�re hard-pressed to find many complete, realistic independent films as this, and this cast is a major reason for its effectiveness. Image Transfer Review: The 2.35:1 anamorphic widescreen presentation does a wonderful job capturing the beauty of cinematographer Adam Stone. The result is plenty of sharp detailed images that capture the Arkansas landscape wonderfully, with bright, vivid colors throughout. Fortunately, there�s no dirt, grain, or other blemishes around to bog down the transfer. Audio Transfer Review: The audio options are a Dolby Digital 5.1 and 2.0 mix, and the former is the one to choose, given a slight bit more depth and aggressive bass presence. Directional effects are utilized in both mixes, and the dialogue is always crisp and easy to understand. Extras Review: The extras include an audio commentary by director Jeff Nichols. The Arkansas native focuses quite a bit on his roots and the film�s relation to them, but Nichols finds plenty of time to go into great detail about the production, acting, and other on-set elements. There�s also a music only track that lets you listen to the wonderful score by the band Lucero. 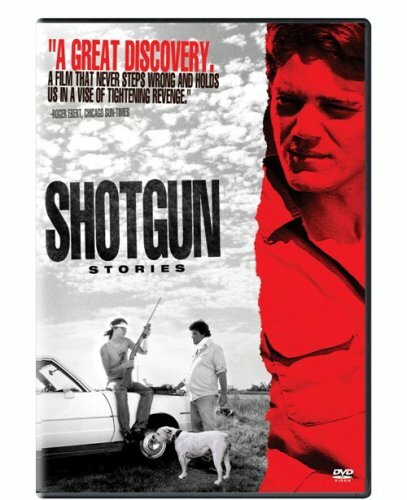 Finishing things up is a photo gallery and a collection of trailers including the one for Shotgun Stories. With little in the way of indie movies showing up in theaters right now, the perfect way to cure the big-budget Hollywood blues is to discover a recent hidden gem on DVD. Shotgun Stories is just such a gem, with a great mix of tight storytelling, sharp dialogue, and wonderful acting making this a no-brainer of a recommendation. Genius Entertainment�s DVD is a nice effort, with great audio, video, and extras accompanying the feature.